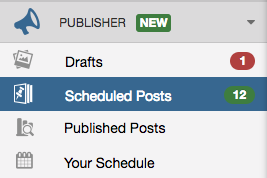 When creating an organic and interesting schedule, every so often you want to mix up your scheduled Posts and shuffle your content. By toggling on Lock on the scheduled pin, Tailwind won't move that Post if you were to re-arrange your content by shuffling. 2. Within the "Your Schedule" section of this page, hover your mouse over the bottom of the Post image to toggle right to Lock or toggle left to Unlock. Helpful Tip: You can still drag and drop a locked Post. We like to think that if you want to take the time to move a Post, it should move!